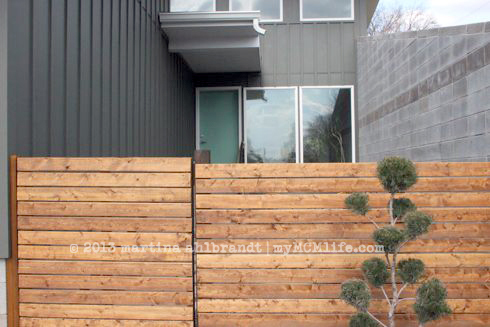 Almost 2 years ago, Jason and I built a modern horizontal plank wood fence at our previous house to enclose our back garden. 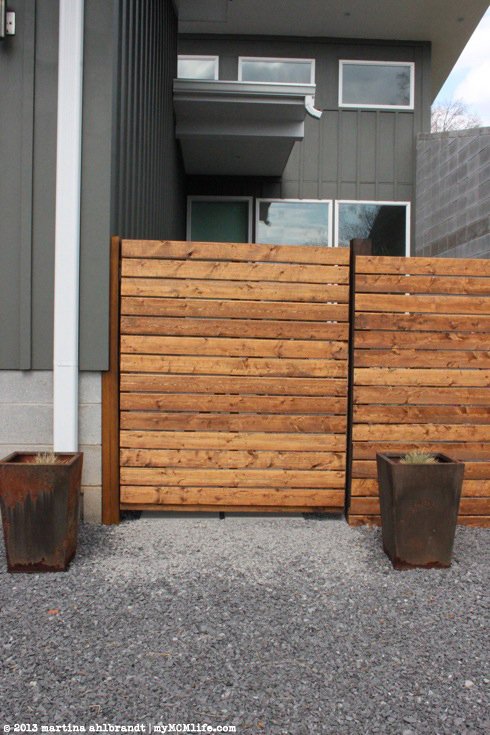 We used the same technique to build this fence and gate to make the fourth “wall” of our courtyard. There were two major differences. 1. We only had a 12′ spanse to build. 2. 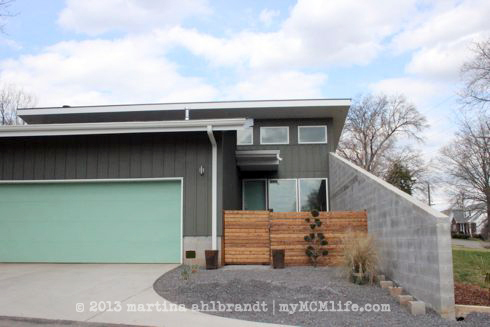 We had concrete walls on both sides. There was only 1 post hole to dig. Hooray! 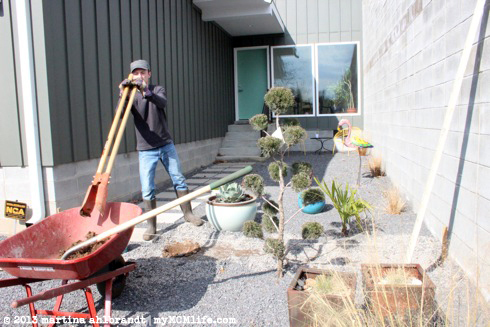 Jason used our trusty old post hole digger. (Jason and that post hole digger have made holes for 2 fences prior to this!) 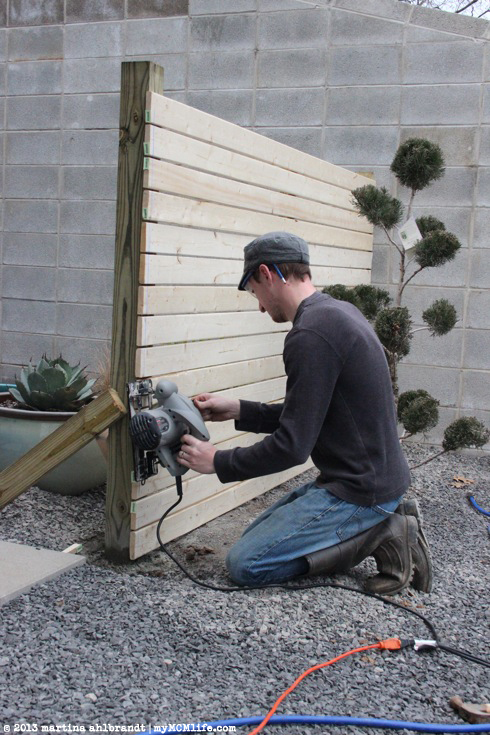 We were only making our fence 4-4.5′ tall so we used a 6′ 4×4 pressure-treated post. 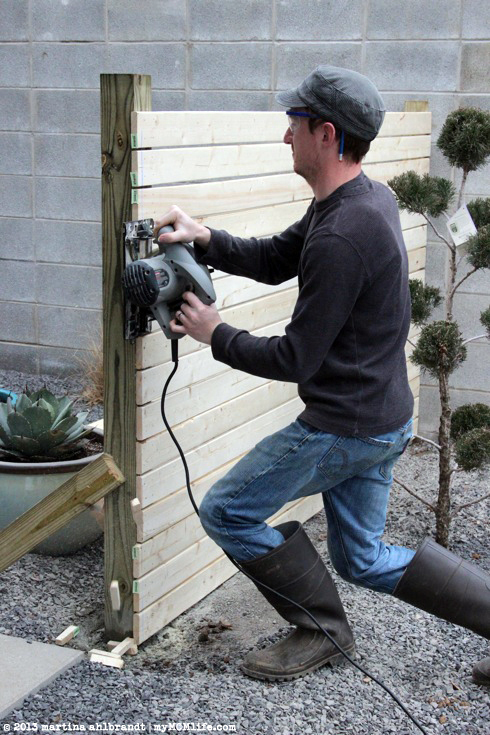 The post hole should be 2′ deep. After making sure it was level, we added a few braces to keep it in place before adding the dry concrete mix and water into the post hole. Jason also added a little concrete mix and water under the post. Next we attached two 2x4s to the side of the house. The bottom piece was going into the concrete block foundation of the house. Drilling screws into concrete is not easy! 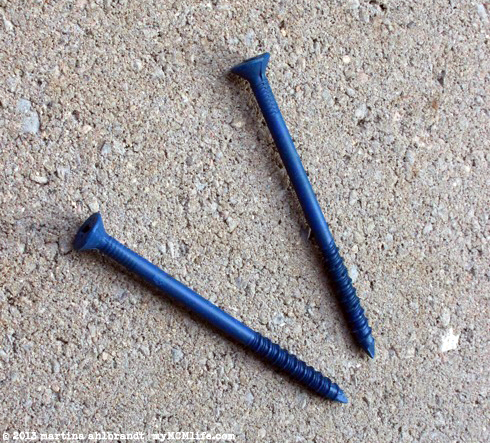 We used these pretty blue concrete screws. Jason pre-drilled the holes for the screws. He opted to drill into the mortar to make it a little bit easier. 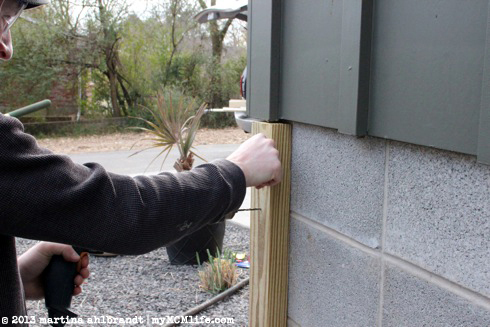 Once that was secure, Jason added a second, longer 2×4 along the house. This one should have been easier because it was only going through wood (the hardibacker siding, the corner beam in our garage and the shorter 2×4 below. We borrowed this powerful hammer drill from a friend (necessary for drilling into concrete) and it was so powerful it stripped our drill bits and one of the outdoor screw heads. It seems like there is always something that goes awry on a project like this. 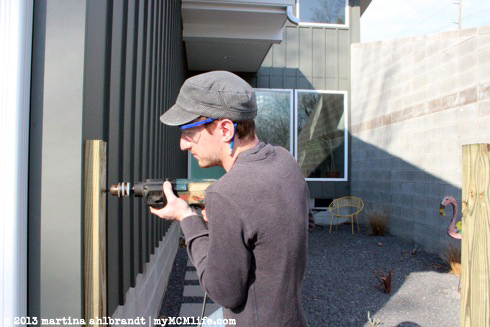 Thankfully, he was finally able to get it secured to the house with a combination of this drill, every star drill bit we own and our wimpy Ryobi drill. The screw that was stripped was cut off with a hack saw. 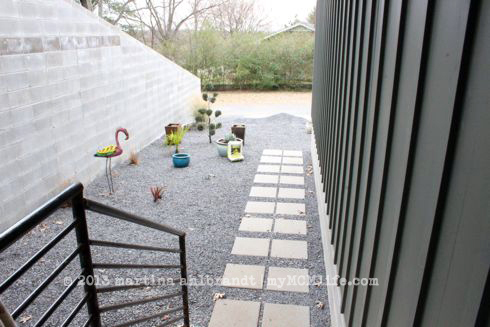 Another 2×4 was attached to the concrete block wall of the courtyard. Everything went smoothly with this one so I didn’t have time to take any photos. 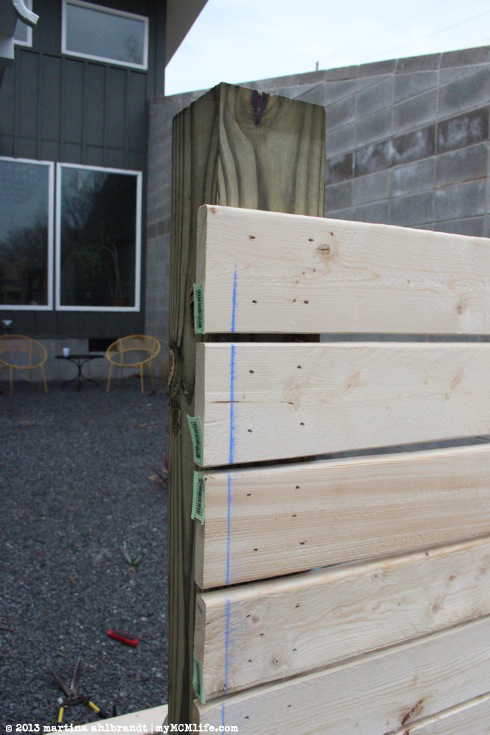 I don’t know if it’s the correct carpentry term but we call the horizontal boards planks (as opposed to pickets on a vertical fence) and to differentiate between posts and planks. Adding the planks went every quickly since we’ve done this part many times before. We started at the bottom, putting the plank as close to the ground as possible and leveling it. I position the plank into place. Jason places the spacer between the planks. Jason fires the nails into place. I position the spacer at the other end of the plank. 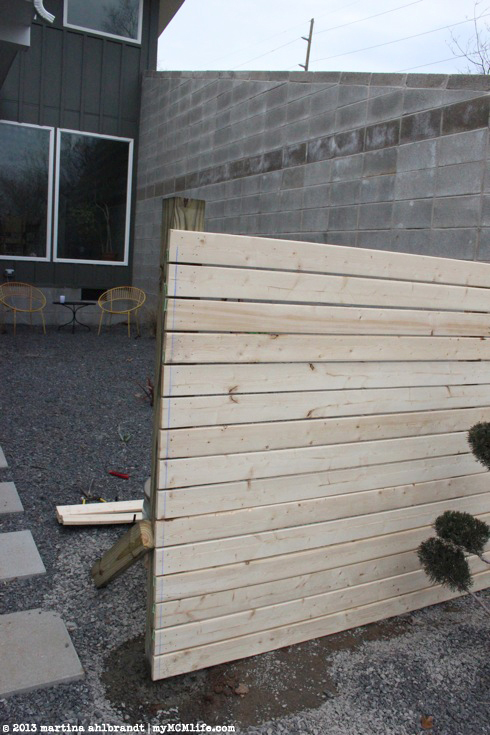 We added another vertical 2×4 on the back side of the fence to keep the planks straighter. This 2×4 post is pressure treated but we didn’t put it into the ground. It’s only helping to keep the planks straight, not supporting the weight of the fence.We used the spacer again to make sure the gap between the planks was consistant. They’re often slightly bowed so we pushed and pulled to get them as straight as possible before nailing. 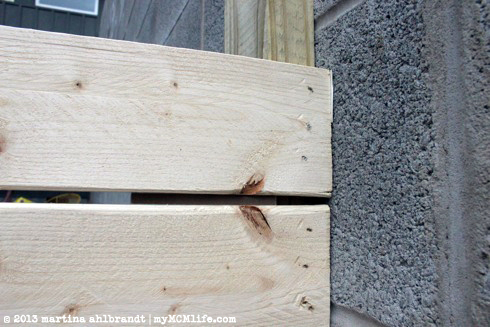 Where the gap was too small, we used a pry bar to move the planks apart enough to fit the spacer. We wanted the planks to be flush with the 4×4 post and we made a chalk line where they needed to be cut. Jason used his circular saw for this. It’s a bit awkward, especially close to the ground. There may be a better way but this works for us. I always insist on the safety glasses. I like how Jason tucks his pencil into his hat. I didn’t do a very good job documenting the gate building process. (We started this project after Ali went down for her nap around 1pm on a Saturday and at this point 3 hours later, she was awake so she could “help” us.) 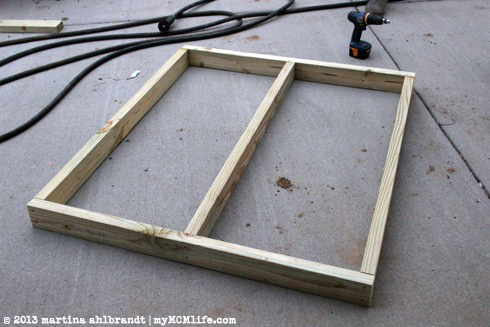 We built a frame out of 2x4s just a bit (maybe 1″ both way) smaller than the opening for the gate. The extra 2x4s down the middle and diagonally (that I didn’t photograph here) help the gate stay square. 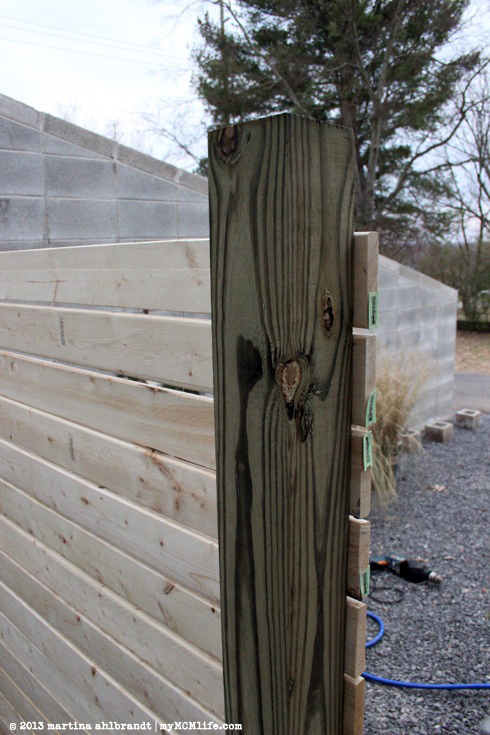 We attached planks in the same way as the fence – starting first with the outside ends, using the spacer, and then the middle post, also using the spacer, using a pry bar as needed. Once it was hung, I took a picture of the back side so you can see the two diagonal pieces of 2×4 we added. I’m sure there is a simple way to calculate those angles and cut them but we had a heck of a time and ended up just experimenting until we got some angles that worked. It was pretty amusing! Jason hung the gate with three hinges while I was inside with Ali so I didn’t get a picture of that process. How he did that himself, I have no idea! He quickly stained the fence using deck stainer and sealer while Ali and I were having a snack. Just before dark, it was finished. Time to go out for dinner! A couple days later, I took some finished pictures. 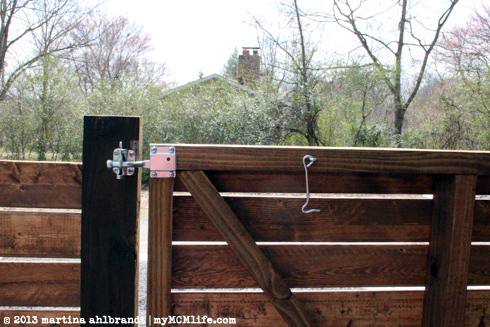 A hook and eye (attached to the house) hold the gate open. 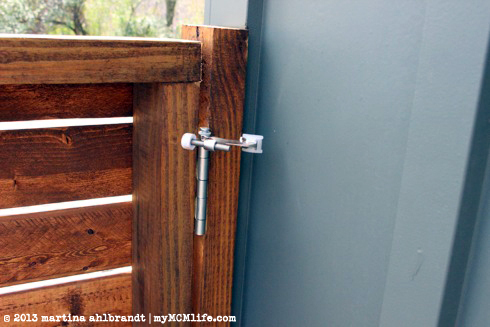 A hinge door stopper (the same kind we used inside) keeps the gate from hitting the side of the house. I love how the fence and gate make our courtyard feel so cozy and private. 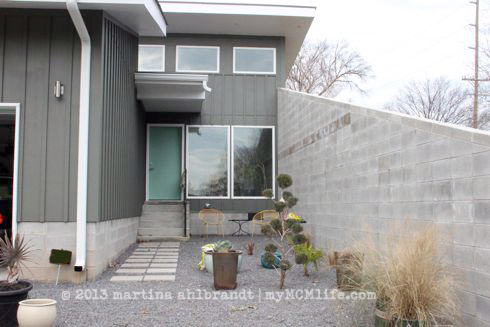 We can sit out here with the toddler and the dog and not have to worry about either wandering out toward the street. This is quickly becoming one of our favorite spots for lunch alfresco, afternoon tea, blowing bubbles for Ali, and evening chats. 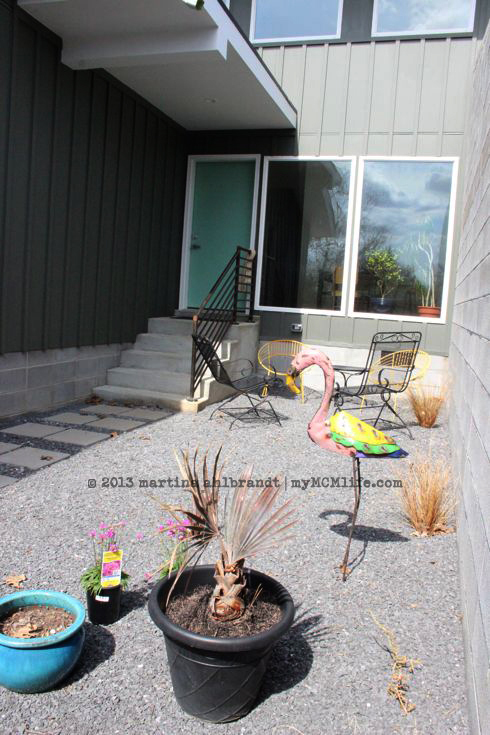 It’s going to be even more wonderful once the landscaping matures. 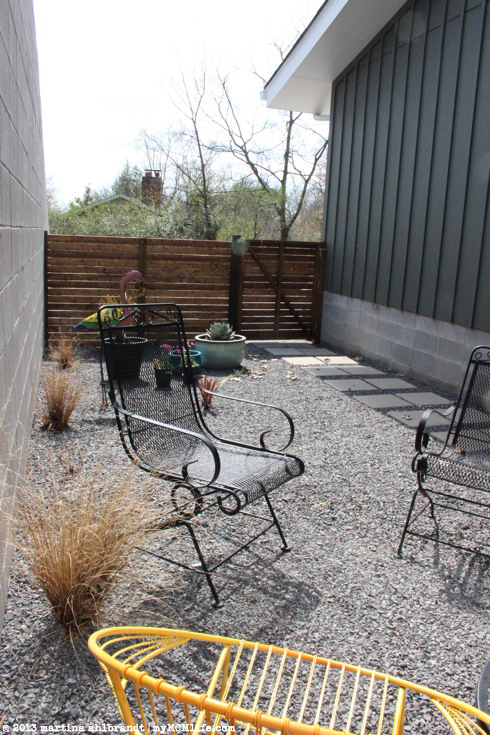 One of our loftier wish list items for our dream house was an outdoor “room,” like a courtyard or atrium. 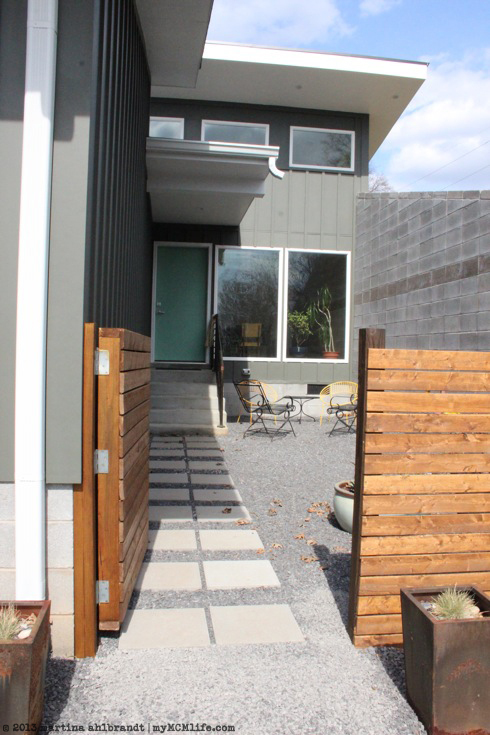 Our architect surprised us with a courtyard was the front entrance to our home. 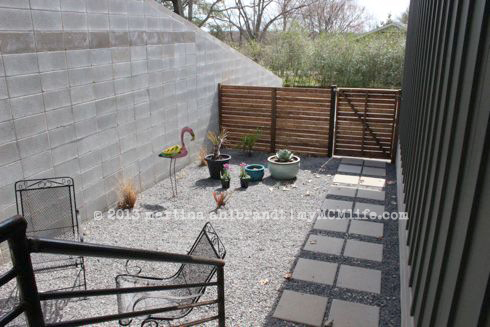 To save money toward the end of construction, we decided we would add the fence and gate to enclose the fourth wall on our own. We finally had a beautiful weekend and time to do a quick project together. 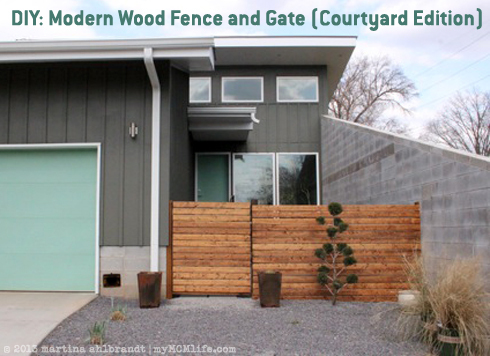 Jason and I used the same technique as the modern wood fence we built at our last house. Without the fourth wall, it didn’t really feel like much of a courtyard at all. Now it feel more complete! We’ve got our own private retreat. This is quickly becoming our favorite spot for lunch and afternoon popsicles. As it gets warmer, I’ll probably start spending my morning time with God out here, sipping a cup of tea. I’ll do a follow up to this post with pictures of our process, as soon as I get around to editing all the photos. 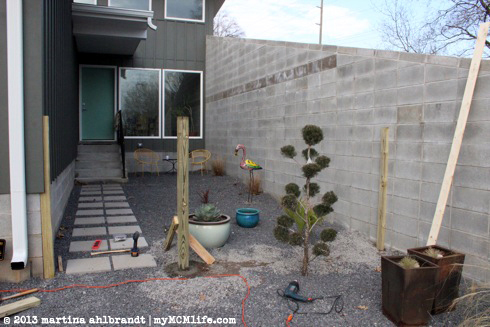 A month ago I published Step 6: Almost Done… Well, we’re still almost done with the fence. Which means not done yet. I needed to refocus our attention on inside projects to get our house ready for our home study. 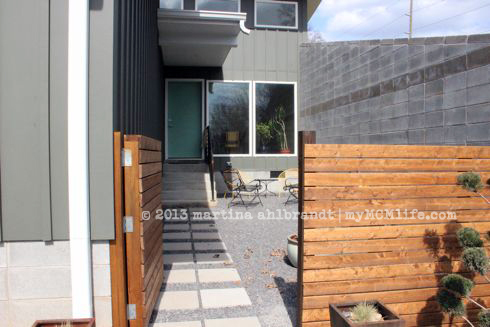 So we STILL have to finish staining, patch some gaps along the bottom and add gates to our lovely modern wood fence. I haven’t told you about these “windows” yet, though. We have a beautiful flowering plum tree that was in the way of our fence. We didn’t want to mangle one side of the tree by sawing off branches so we decided to build the fence around the tree. 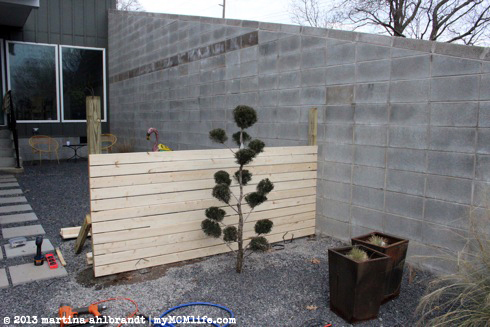 Or is it build the tree into the fence. Or build the … nevermind. See what we did here? When I came home from work one day last week I found Jason staining the fence with deck sealer. He was able to finish the inside but hasn’t had a chance to stain the outside yet. This section (the one on the right) is especially dear to me. Why? Because I nailed it all by myself. After absorbing the shock of 5,000ish shots from the nail gun, Jason’s shoulder needed a break. While we waited for the ibuprofen to kick in so we could keep up our pace, I took over nailing a section. Clearly, I’m quite proud of myself. Jason is definitely faster at though, and it’s hard work, especially above elbow height so I was happy to hand the gun back over to the boss. Here are some pictures of the rest of the fence which is mostly finished from the inside. The last post against the house is a 2×4 that is not sunk into the ground. Eventually we’ll get around to anchoring it into the mortar of our brick house. For now, it’s wedged tightly enough that it’s holding the fence up straight. Side note: this dogwood tree looks amazing this spring! Side note: the bottom of the birdhouse is falling off. Thankfully no birds live there. Actually, that’s probably why no bird live there. We’re really please with how it turned out. We still have some areas along the bottom that need closed up, in addition to more staining, finishing the area around the deck and adding 2 gates. 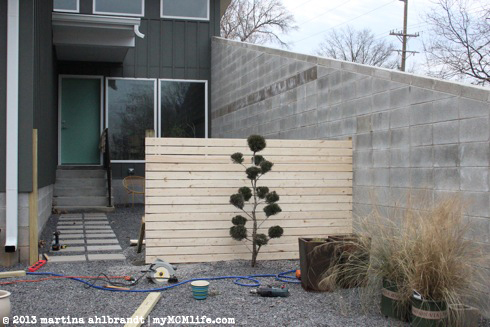 I tricked you… my last update on the fence showed our progress of staining, nailing planks and troubleshooting and I said the next update would be more of the same. Jason and I worked really hard all day on Saturday trying to take advantage of a rare day off together and the gorgeous weather. We worked so fast that I didn’t stop to take a single picture. Except for this one of our last load of wood from Lowes. These are our vehicles. We don’t have a truck, a van or an SUV. (Although we secretly wish we had a minivan!) We have compact and mid-size sedans and we make them work. 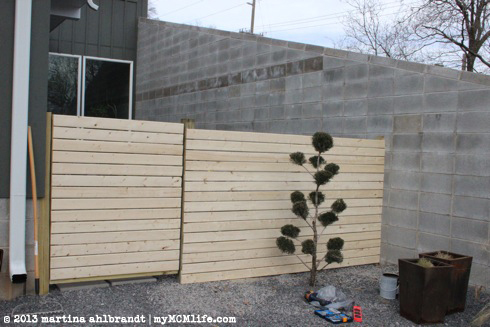 We lost track of how many roundtrips to the hardware store it took us to get all the wood for the fence. Probably around 7 or 8 trunk-loads. Lowes was running a sale the past 5 days that was definitely working in our favor. With every transaction we were given a coupon for $10 off our next purchase of $50 or more. Each trunk-load cost approx $100 so we saved at least $30 this weekend with our last 3 trunk-loads. We weren’t planning that or trying to cheat their system, it just happened that way. Pictures of the actual fence progress will be coming soon. We have a couple more sections to finish with planks, a few troubleshooting areas, some finishing details, 2 gates to make and a whole lotta staining left to do. I don’t have a concise title for this post. I was going to call it staining posts, spacing and nailing planks and troubleshooting but that seemed to long. Also, the next step is going to be more of the same. 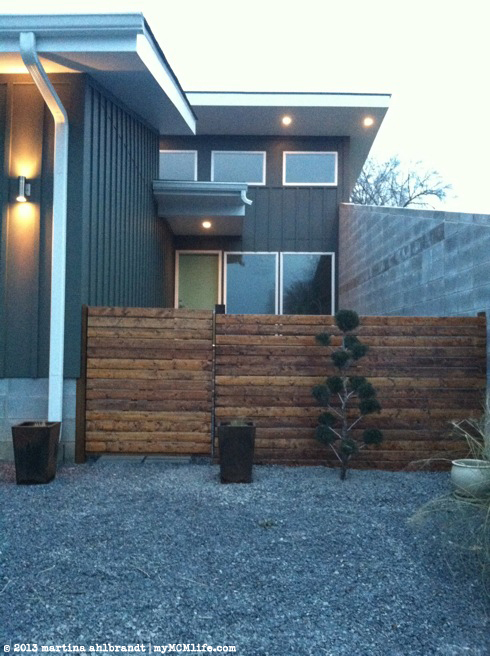 I failed to take any pictures while we worked on this first side of the fence so here it is. 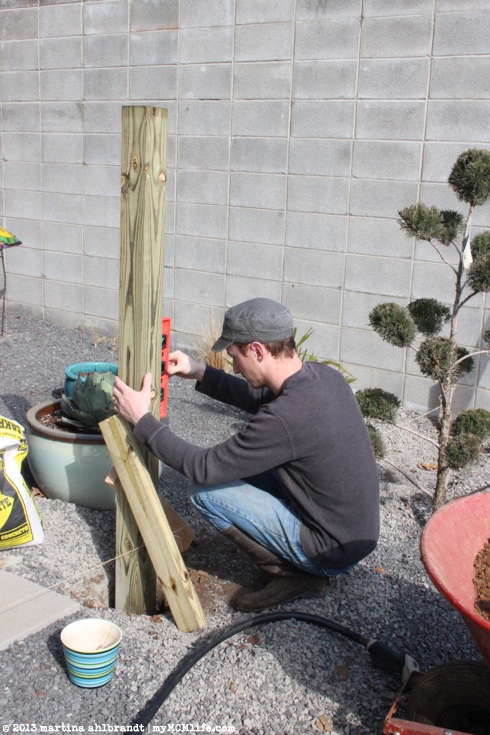 You’ll notice that about half-way between each 4×4 post (that’s either anchored to the concrete with an EZ Post bracket or concreted into the yard) Jason added another vertical 2×4. Each plank is nailed to this 2×4 to keep the planks from warping or bowing out between the 4×4 posts, which are a little less than 8′ apart. This is where we left off when we had to go buy more wood. We just have a sedan so it takes a lot of trips to the hardware store to get all this wood. 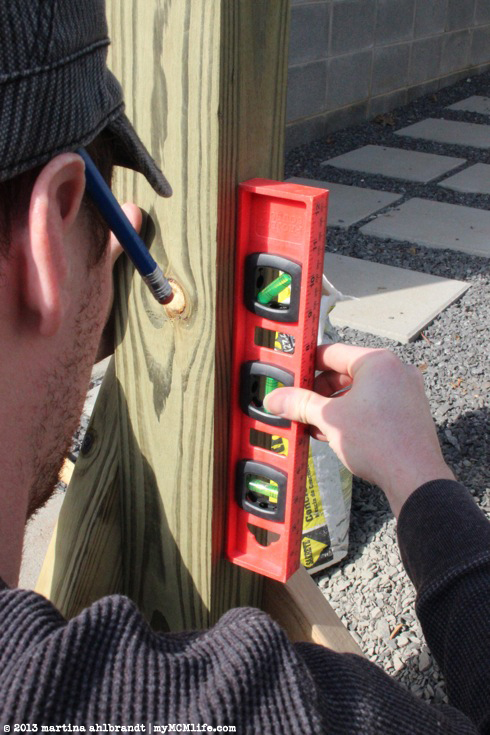 Our handy EZ Post brackets cause a minor predicament because the planks couldn’t be nailed into the post for the bottom 6″ or so. That is enough room for pesky disgusting cats to get into our garden. Not acceptable. 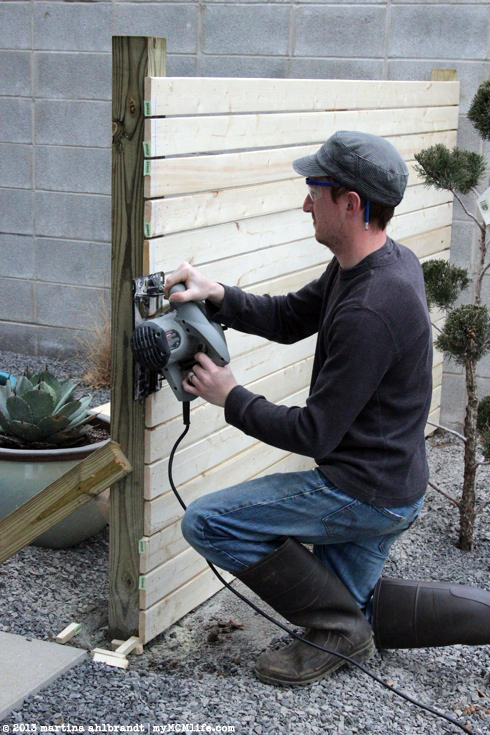 Jason came up with this solution to add 2x4s along the sides of the posts at the bottom so he’d have something to nail the planks into. Here’s a look from the other side. Lucy approves. 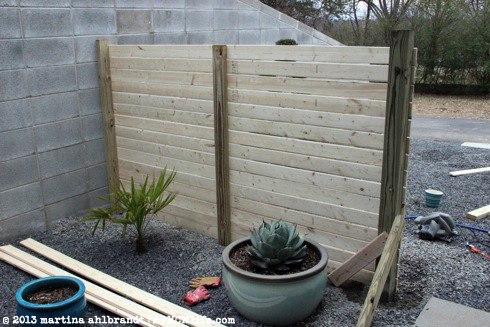 Proper fence etiquete is to put the outside, finished side of the fence facing your neighbors and to put the backside facing your own yard. 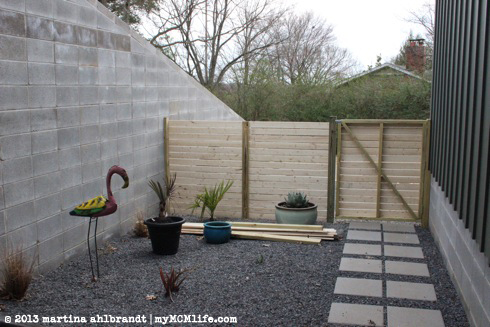 Because this fence is not going around the perimeter of our yard—and we may some day add a perimeter privacy fence–we opted to put the finished side facing in. That created another slight problem when it came to the first corner. Jason came up with a clever solution using a 2×4. Nice and clean looking on the inside corner. We’re using 8′ long planks and we purposely put the fence posts less than 8′ apart so we could trim off the excess and get all the ends clean and square at every post. 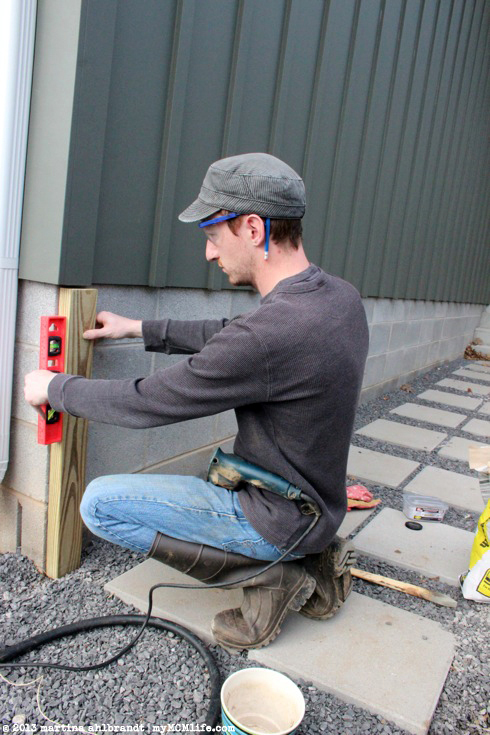 Jason set his circular saw to the depth of the planks (they’re 1×3’s so approx 0.75″) and trimmed off the ends of the planks at the center point of the post. Here’s what the other side of the post looks like. The planks are cut at the halfway point of the post so that Jason has room to nail the planks for the next section of fence. We may or may not have learned this lesson the hard way on the first post: make sure you put all the horizontal plank nails only into one side of the post. 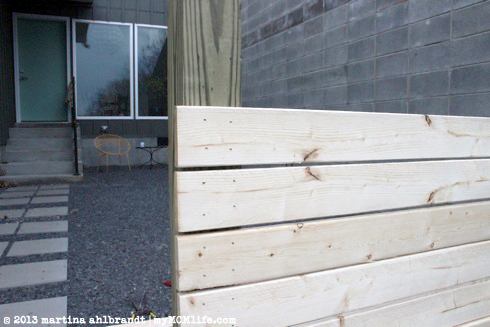 Because in the next step, you’ll be adding more planks to the other half of the post. So here is where we left off. Out of wood. Out of time. And it got cold out. We’re hopeful we can get it done in the next couple of weeks. Notice where Jason started testing out the stain/sealer.